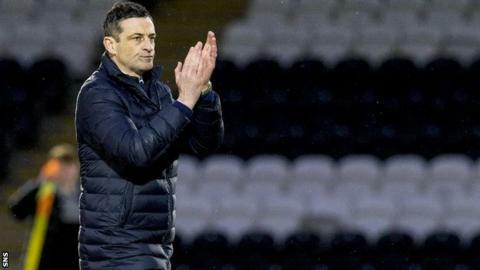 St Mirren manager Jack Ross is staying at the Paisley club after holding talks with Barnsley about their managerial vacancy. The English Championship side were granted permission to speak to Ross, but will now need to pursue other options. Barnsley have also held talks with Swansea City Under-23 boss Cameron Toshack. The Tykes need a replacement after Paul Heckingbottom moved to Leeds United. "We are delighted with the news that Jack remains committed to St Mirren Football Club," said chief executive Tony Fitzpatrick. "Jack has built something special here and has really pulled everyone together in the right direction. "It is excellent news for the club and all focus is on trying to meet our targets for the season." Ross has guided St Mirren to a 14-point lead in the Scottish Championship as they chase promotion. The 41-year-old Scot was unable to prevent Alloa Athletic being relegated from Scotland's second tier after taking charge of the part-timers midway through the 2015-16 season. But, with his side sitting second in League One the following season, he moved to St Mirren, this time managed to lead the Paisley team clear of the drop zone and has put them in a strong position to win the title in his first full campaign. Ross had a previous spell in English football - a year at Hartlepool United during his playing career, which also took in spells at Clyde, Falkirk, St Mirren, Hamilton Academical and Dunfermline Athletic. While Buddies boss, he sold Stevie Mallan to Barnsley last summer, where the midfielder is a team-mate of former Partick Thistle defender Liam Lindsay. with the side sitting third bottom of England's second tier. The Tykes' recent Swansea connection comes in the shape of Scotland Under-21 striker Oli McBurnie, who is on loan from the Premier League club. Toshack, the 47-year-old son of former Swansea, Real Madrid and Wales manager John, had limited success as a player, being on the books of Swansea, Bristol City, Cardiff City and Weymouth. However, he was on the coaching staff of Wales and Macedonia before joining Swansea's back-room team in 2013.